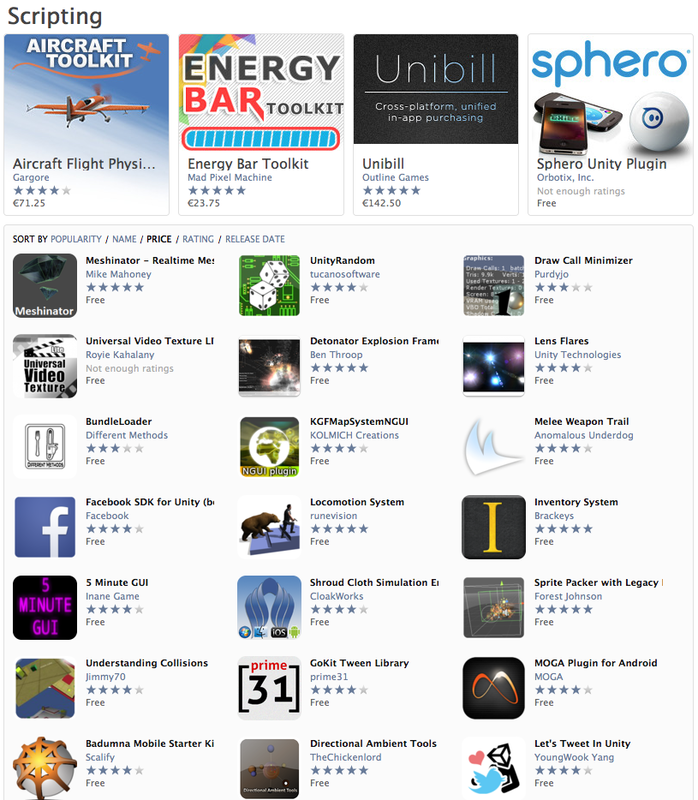 The asset store is great for many reasons. 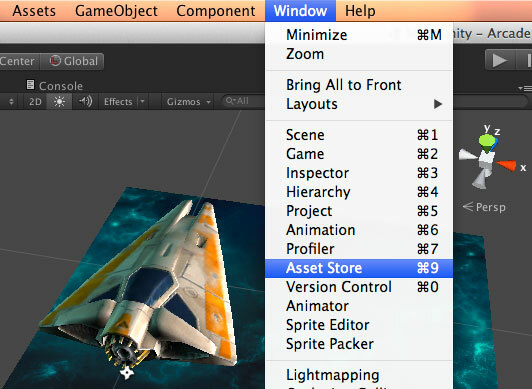 This is how Unity Technologies distributes its assets, many of which are free, including the spaceship assets shown in the image above and the title image. More importantly, this is a portal for the Unity Community to distribute the assets they have created. The Assets Store categorizes all of the assets available. We can browse for Models, Textures, Sounds, Animations... For me, some of the most important assets are Scripting and Editor Extensions. Finding a quick model or a great texture for our game or prototype is fantastic. However, technical solutions for, say, touch gestures, Facebook integration, automated builds of an iOS app that are seamlessly uploaded to TestFlightApp.com… priceless! There are systems we will need in our games or to enhance our editor experience. These could take us days, weeks or more to create. The asset store can give this to us with the click of a button. Many, if not most, assets on the Asset Store are for a fee. That being said, there are also may many free resources, and the many of the assets that are available for a fee are available for a very affordable price. When it comes to the community, we cannot overlook the Wiki. At the time of posting, the wiki is a community driven, community supported resource. 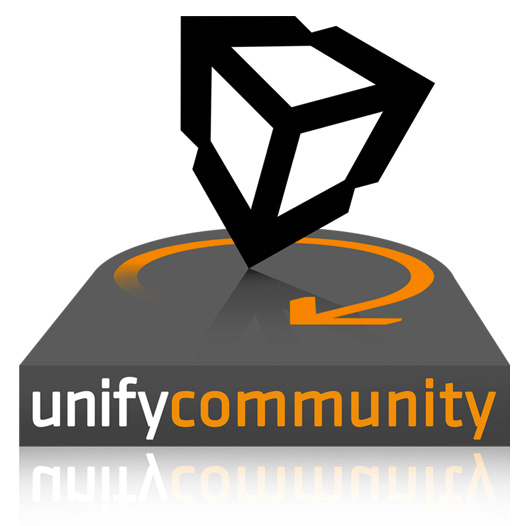 It has been around since the very beginnings of Unity and contains a wealth of information and scripts: http://wiki.unity3d.com Remember to “pay if forward”. If we use assets from the wiki, we must try to contribute some time back to the wiki by posting scripts and tips and updates to the assets we do use. Lastly, I have a list of sites that I have compiled, where we can find assets for out games. Again, some are free and some are for a fee, but all should be affordable. Please do be aware of the licenses that these assets come with. Some free assets come with strict non-commercial license agreements. Others come with attribution required. If you are in doubt about a license agreement, don’t use the asset until you have sought professional legal advice. If you know of any additional resources or resource sites that can be added to this list, please leave them in the comments and I will update this post with that new information as soon as possible. Hmm... Good Point about the 1001freefonts. I'd rather not remove it, but I'll flag it with caution. This is as much to warn people as to advertise it. If we say nothing, then people can find it without knowing there is an issue. Thanks for the link to http://www.1001fonts.com. Added! I just found this site: http://www.handpaintedtextures.com Looks great! Interesting! Tutorials! I hadn't thought of them as assets... But maybe I should do a post on learning resources for new users. I'll leave this link in the comments until I can find it a good home. Thanks for the link!